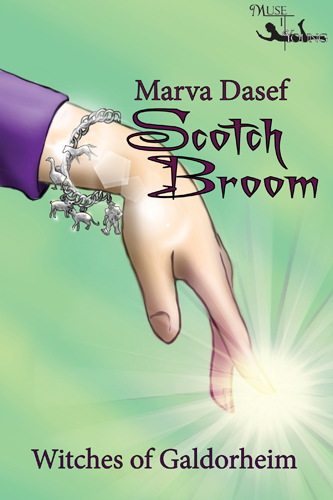 My guest today is Marva Dasef, whose Witches of Galdorheim middle-grade novel series just got its third installment, Scotch Broom. Marva talks about the realization that she had a series on her hands. Sometime in 2008, I woke up with two words in my head: bad and spelling. I must have had some subconscious blip that produced the thought, but I’ve no idea what it might be. As I sipped my first cup of coffee, I opened a text document and entered BAD SPELLING at the top. Then I stared at it and a few thoughts came to mind (okay, that might not have happened until my second cup of coffee). I wondered why my subconscious was talking about poor spelling since I’ve always been a very good speller. Obviously, it didn’t have anything to do with anything so mundane as a spelling bee at school, although I won’t discount the possibility. If you’ve ever experienced a “school” dream where you’re wandering around not knowing where your next class was being held, or where the heck they put your locker, or somewhat embarrassed to find you’re only have your underwear on, then you know the horrors of the “school” dream. Many people have them, nothing to be ashamed of. Despite the origin lost in the dreamworld, my next coherent thought was that “spelling” had to do with spellcasting. Okay, I write books for middle-grade kids and they love fantasy, so a witch or wizard must be involved. Why would a witch (and the main character turns out to be a teen witch) be really bad at spellcasting (or simply put, spelling)? And if she was a lousy speller, why would it bother her? Well, because she’s surrounded by other witches having no problems spelling at all. What’s worse is she has a little brother who’s a super speller, and cute besides. That’s enough to put a twist in a witch’s ego. Katrina turned out to be the witch, and her annoying little brother became Rune. Note that Rune has a cool, wizardly name while Katrina is stuck with a name that sounded like a Russian doll. Blech! I did that on purpose because Kat (as she prefers) is disturbingly mundane for a witch. Further coffee and thinking led me to believe that the witches of the world might like a place where they could let it all hang out, be witches without worry what the mundane neighbors might think. It occurred to me that witches were persecuted in the Middle Ages, and it only made sense for them to get the heck out of Dodge and go somewhere of their own. This somewhere is about as remote a place one could find, being a glacier-covered island in the middle of the Arctic. Galdorheim Island became my setting. Eventually, I worked out why Kat is a lousy speller, and what she had to do to solve her problem. At first, she simply wants to run away from home to find her deceased father’s family, who happen to be a tribe of fisher/hunters in Siberia—the Samis (closely related to the Lapps of Norway or the Inuits of Alaska). Kat’s journey to find her father’s family puts her through a lot of danger and an interesting journey meeting all sorts of magical types along the way. Kat eventually solves her magic problem and gets Sami boyfriend as well. I did the query thing for awhile, but threw up my hands in despair when one agent’s response at a writers’ conference is that Katrina was a bad choice for the MC’s name while the brother had a cool, warlocky name. Did. Not. Get. It. Along with a few requests for partials and fulls, but no bites, I figured that I was fighting a fruitless battle. After all, I’m a retired person, meaning I have a limited number of years to make good. I could croak tomorrow, and my great story would be DOA on my hard drive. Long story short, I changed tactics and queried small publishers directly. Still nothing, so I decided I may as well write another book with the same characters. How’s that for completely illogical thinking? Nobody wanted the first book, so why would I think a second book would have a better chance? Because I had a title. From the mysterious aether of my subconscious, the words “midnight” and “oil” came to mind. Oooh, my favorite! Another pun. 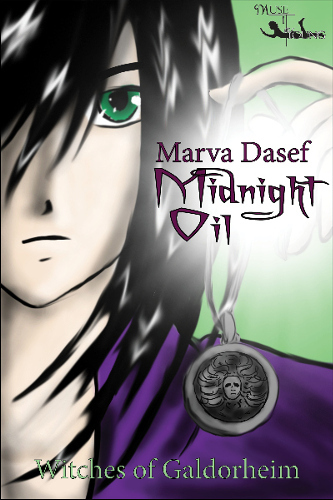 Midnight Oil followed Kat’s and Rune’s adventures in a new book. Let me tell you there was a whole lot of interesting research that led me from the bare bones idea of Midnight Oil, to the ensuring dire circumstances which included the Loch Ness monster, a forest elemental spirit, and a magical ultralight. Since things come in threes, I was now obligated to write a third book. Three is a mystical number which is the minimum required to make a series. I could write another book for a quadrology or not as I choose. Now I was under the gun. I decided Kat needed to have a vacation and came up with the Witches’ Winter Abroad idea. This gave me the freedom to pick another area of the world (although not too far from the Arctic) and delve into a new mythology. Scotland became the site of Kat’s next adventure. Everybody and their Irish Wolfhound does Irish Celtic myth, so I stopped short and led Kat into the Highlands for a slightly different Celtic flavor. Research revealed a lot of mythology that did not include the usual suspects. I went to the deep base of mythology. The old mythical pantheon had a lot of material that wasn’t already stomped all over by every author who wanted a character named Siobhan (which I still have no idea how to pronounce). I did find Cailleach, the winter foil to Bride, the goddess of Spring. Old Cailleach could very well have fallen on hard times, has hidden herself away in the Otherworld (which just so happens to be on an alternate plane of existence as the Scottish Highlands). When I shoved Kat into Cailleach’s Otherworld, I figured she had to be lost, otherwise, she’d just step out of the Otherworld and continue her trip abroad. From this simple base, I provided Kat with a few companions to meet along the way: Sianach, a giant meat-eating stag, Cusith, a giant (notice a theme here?) green dog with a braided tail (don’t blame me, blame the Scottish whiskey for this one), and Cait Sidhe, the giant (well, not too giant) black cat fairy. Where does Kat want to go? To see the Trow King, of course. Now, I’ve got Wizard of Oz written all over this story. Subtle, eh? This book didn’t have a title at first like the others, but I soon came up with Scotch Broom, and you can read the book to find out why. There they are, then. A series of books that all came from a title. All I had to do is add words. 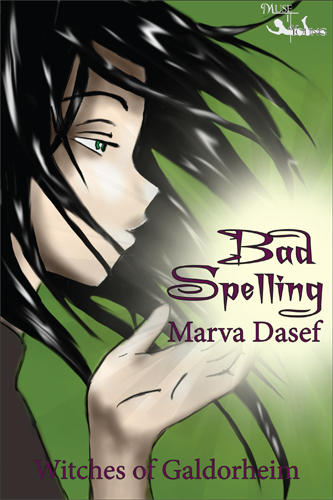 You can visit Marva Dasef at her website and blog. The Witches of Galdorheim books are available at MuseItUp, on Kindle, and elsewhere. Please welcome historical romance novelist Carol A. Spradling. Her novel Shades of Gray was released recently. Carol discusses her unusual approach to building the romantic relationship in fiction, as well as the attraction that historical fiction has always held for her. I hear it all the time. Historical fiction, especially with a colonial setting, does not sell. This statement reminded me of the reason I began my writing career. As a teenager, I cut my adult reading teeth on authors like Kathleen Woodiwiss. Granted, she used more detail than I cared to read, but her main writing staple had both of the main characters married in the early pages of the book. I loved that. Whenever a book has the characters realizing their feelings for each other in the last few pages, I find myself glad for the happily ever after ending but disappointed overall. In my mind, this is where the story begins. I want to see these two characters weather life as a committed unit. Since I am an avid reader, I searched for authors who thought as I did. They were rare. A book’s setting is high on my lists of ‘have-to-reads”. All an author has to do is place me in Colonial America or England, and I am home. It doesn’t matter what is thrown at the main characters. I will sweat it out with them, good or bad, until the last page. Many times when I read a book, I would finish the book, sigh, and flip back to page one. Why not? I knew where all the good parts were and how many pages it would take to get there. The second read through is to look for all of the clues the author hid and that I carelessly raced over in my effort to discover what was happening next. Over the years, I hiked to the bookstores once or twice a month. During each trip, I found myself with a smaller stack of books at the cash register. I understand that everything travels in a cycle, and authors can only write so fast. Maybe a lengthy fan letter should have been sent to a few of my favorites. You know, to encourage them to spend more time at the keyboard. I know there are other great genres out there, but I had a favorite, and it was hard to make the transition. This character flaw coupled with empty nest syndrome was just the combination I needed to launch my writing career. With a few hours of uninterrupted computer time at my disposal, I sat down and thought about details I enjoyed reading in a book. A hot guy and a gorgeous girl were at the top of the list. A rule of thumb is to write what you know. Having grown up in the eastern United States, this seemed a good place to start. Conflict and supportive characters expanded the plot. One person described my writing style as old-school. I have a vague idea of what that means, but it sounds appropriate. Old-school or new, it goes without saying, as for my main characters, wherever I take them or whatever turmoil they face, they are going to take on the challenge together. You can visit Carol A. Spradling at her website and her blog. You can purchase Shades of Gray on Amazon. 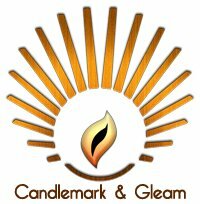 Candlemark & Gleam, my publisher for Green Light Delivery, entered me in The Qwillery's Debut Author Challenge. To introduce myself, I wrote an essay called "Green Light Delivery as a Sci Fi Stew." It's about process and genre-blending. You can read it here. In other news, my flash story "Aquarium" was accepted by Drunk Monkeys and should be posted there any day now. My Duotrope "Response pending" list is up to 14 stories, plus I have a novel and a picture book text out looking for homes. So my main activity these days is waiting. Waiting and writing, of course. Today's guest, Pembroke Sinclair, discusses the writing of many genres (I can sure relate to that! ), and the joy of focusing on Zombies. Read it if you dare. I love to write. Period. If I don’t write, I get really grumpy and am quick to temper. Ask my family, they’ll tell you all about it. It doesn’t matter what I write, as long as I write. I’ve written romances (not ones with a capital R, but there have been relationships in my stories), horror, sci fi, fantasy, Westerns (not traditional ones like Louis L’Amour, but stories based on life in the West), along with nonfiction articles about agriculture and serial killers. I have children’s stories coming out later this year, as well as religious horror novellas and a nonfiction book on slasher films. I’ve often wondered if I should narrow my focus down to one genre. After all, Stephen King is the master of horror, Anne Rice is known for vampires, as is Stephanie Meyers, and J.K. Rowling cornered the middle grade fantasy market. But then I think: won’t I get bored? Do I really only want to write about zombies for the rest of my career? Or distant planets? I wonder if any of the authors I just mentioned get tired of writing the same thing over and over. I think I’m new enough to the publishing game that I am allowed the freedom of experimenting and exploring different genres. Besides, even the authors I mentioned previously didn’t always stay in the genres they became well known for. Stephanie Meyer has a science fiction novel. One of King’s greatest works of all time is the Dark Tower series, which is a cross-genre series. Just because a person becomes famous in a certain genre doesn’t mean they have to stay in that genre. I like to experiment. I like to try writing in different genres and see how they do. It challenges me to become a better writer. While I really like zombies, I don’t want them to be my only focus. That’s limiting. I want to be able to spread my writing wings and explore what I want to explore. However, just because I like to explore different genres and experiment with writing, that doesn’t mean I don’t have favorite genres. I do actually prefer to write in the sci fi or fantasy genres. Horror is all right, but it takes a lot to scare me, so I don’t think my books are overly frightening. My most recent attempt at horror was my young adult zombie novel called Life After the Undead. 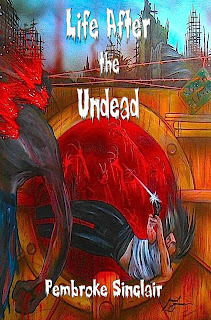 It is my most recent book (it came out in 2011), and the sequel, Death to the Undead, is scheduled for publication in May. Even though horror isn’t my favorite genre to write in, so far, this is my favorite series. I really got into the characters and had a great time with them. They always surprised me with their reactions to certain situations. They definitely took the story and made it their own. 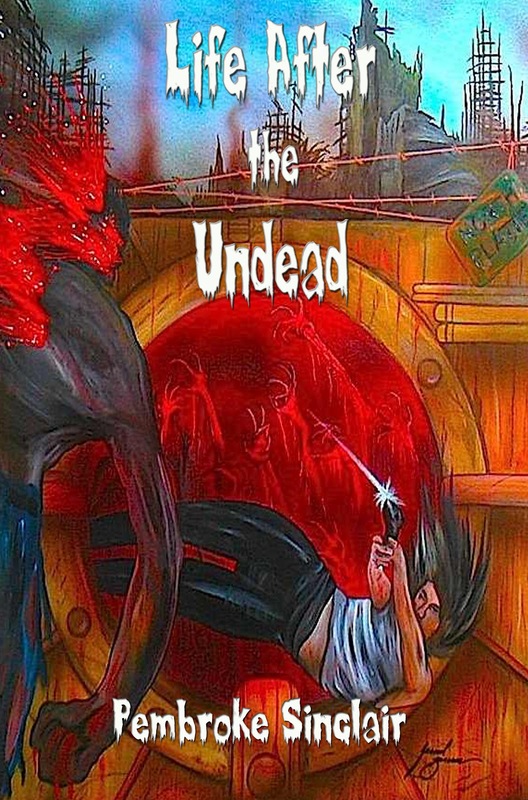 You can purchase Life After the Undead on Amazon and eTreasures. You're also invited to visit Pembroke Sinclair's blog.